Horton Group's new A Beginners Guide to Inbound Marketing ebook discusses the four stages of the inbound methodology and how to execute on each stage. “Our entire resource library has been created with one goal in mind: to support our existing clients and to help businesses and organizations make the best marketing choices. 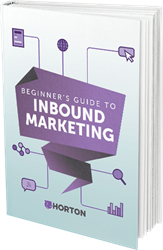 Horton Group, a full-service digital marketing agency with offices in Nashville, Tennessee and Bonita Springs, Florida, is proud to announce the publication of the agency’s most recent eBook, A Beginners Guide to Inbound Marketing. Joining Designing an eCommerce Store that Sells, 25 Website Essentials to Build a Conversion Machine, the Custom Development Worksheet, and 6 KPIs to Make Your Boss a Marketer, this latest free resource from Horton Group introduces readers to the inbound marketing methodology. “Our entire resource library has been created with one goal in mind: to support our existing clients and to help businesses and organizations make the best, most cost-effective, most efficient marketing choices possible.” said Horton Group Inbound Marketing and Inside Sales Specialist, Samuel Bradshaw. Well-executed inbound marketing strategies attract customers to a company’s products and/or services, so that businesses don’t waste valuable resources on costly and ineffective outbound marketing strategies like telemarketing, direct mail, billboards, and ad spends. As a HubSpot Partner, Horton Group’s team of certified inbound marketing experts have authored a concise eBook that defines inbound marketing and explains the four stages of a successful inbound marketing strategy: attract, convert, close, and delight. Readers will learn more about the power of content marketing, creating effective buyer personas, how to optimize landing pages, how to effectively close leads, and creative ways to delight new customers. Horton Group is a full-service digital marketing and design agency headquartered in Nashville, Tennessee. For 20 years the agency has helped organizations in a wide variety of industries bolster their presence and business online. Using a team-based creative approach, Horton Group provides dynamic solutions in inbound marketing, website design and development, custom mobile applications, search engine optimization (SEO), social media marketing and more. Working in close collaboration with clients, Horton Group’s goal is to deliver remarkable results.